Men and women and children knew, or felt, that when Gandhi fell by the assassin’s three bullets the conscience of mankind had been left without a spokesman. 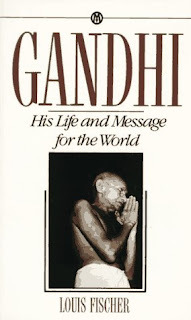 I really enjoyed the movie Gandhi and have wanted to learn more about him. This sounds like a good place to start. I've known very little about Gandhi but have heard some of his philosophies - little quotes or sayings only. I've wanted to learn more about him also. I agree with Shelley that this book "sounds like a good place to start." Thanks for your interesting review! The movie is based on this book. The author tried for decades to get it made but they never had enough money until the 80's. For filming Gandhi's funeral procession the crew put up flyers calling for as many people as possible to line the streets. Hundreds of thousands of people showed up. The most extra's ever in a movie, or so I've heard. This book is full of his quotes. Fischer really adored the man, and he holds little back. Sounds like a fascinating read. Your review makes it sounds so compelling and something I'd like to check out. Thanks Lula!